Every month I hold a Lunch and Learn for the employees at the Liz Claiborne Corporate headquarters in New Jersey. This month’s topic was about Stubborn Fat Loss. Usually with these presentations, I distribute the powerpoint slides to everyone on my mailing list, but as I was giving the presentation, I realized I should’ve really named the presentation The Science or Physiology of Fat Loss. What I like most about these presentations is that the science behind many of the recommendations I make are presented and the people walk away having a better grasp as to what they need to be doing along with strengthening their why. As I was doing the research for this presentation though, I knew I was in trouble when I started getting into the extreme details I know most people could care less about. Although when everything came together the presentation made sense, if I were to simply post the presentation most people would be left with more questions than answers. In order to not have that happen, I’m going to try my best to present The Science of Fat Loss in a way that most people can understand. Quick Note: Despite having seen most of the information regarding this topic from a number of disparate sources, a great condensed and easy to understand manual that brings it all together is Lyle McDonald’s Stubborn Fat Solution. If you’ve ever wanted to know how to lose that last bit of fat, I suggest making an investment of under $50 and feel much smarter and empowered in your efforts. With all of that out of the way, let’s get into the heart of this discussion. 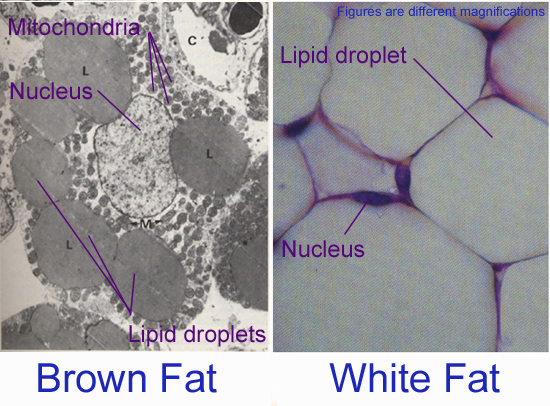 In the human body their are a number of fat sources, with three main ones (This is not an all inclusive list, but it does cover the big ones). This Fat is mainly stored around the stomach region, but isn’t the type of fat you can grab. The word “Viscera” means organs. 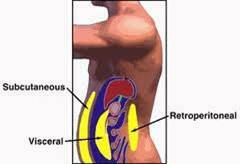 When you hear the term Visceral fat, it means the fat surrounding your organs. Visceral Fat acts as an active endocrine system, which means it releases hormones. The hormones that this type of fat releases though are highly detrimental to your health and basically increase inflammation throughout the body. Inflammation has been linked to or exacerbates nearly every chronic disease you can think of. This means inflammation makes diabetes worse, heart disease, arthritis, Alzheimer’s, leptin resistance, liver disease, cancer worse and yes, will make someone obese more likely to become more obese. In general, this fat is the worst for you from a health point of view. Brown Adipose Tissue is a metabolically active fat that’s used to increase body temperature and keep you warm in cold climates. If you’ve ever had the chills, then you’ve activated your BAT. Most adults don’t have much BAT, but small children do and when people say you’ve lost your baby fat, they literally mean BAT. Whenever you activate BAT, you actually increase the amount of fat you burn (the triglycerides in your blood). There are a number of things that seem to activate BAT with exercise and cold temperatures being the main two. Although both of these things are good for fat loss, as stated above, BAT caloric burn is small due to the small amount of BAT that adults have. As an aside, one of the many differences between people that respond well to exercise versus responding better to diet is the amount of BAT they have. Generally most adults have small amounts of BAT, but some people have higher amounts. This means they burn more calories after a workout than someone that with smaller amounts. WAT doesn’t sound as nice as BAT, but this is the fat that’s generally found under the skin or better known as subcutaneous fat. This is the fat you can grab and is found under the skin. When doctors say that fat around your hips is less dangerous than fat around your waist, what he is saying is that there’s less fat around your organs and is therefore less dangerous to your main organ systems. These 4 things I will be discussing in more detail in later posts. For now, understand that not all fat is as easily burned for these 4 main reasons. The next post in this series will talk about what effects fat loss in the short-term. If you have any questions, leave a comment below.